CONCORD, N.C. -- Martin Truex Jr. knew his bad luck on the Sprint Cup circuit had to change. 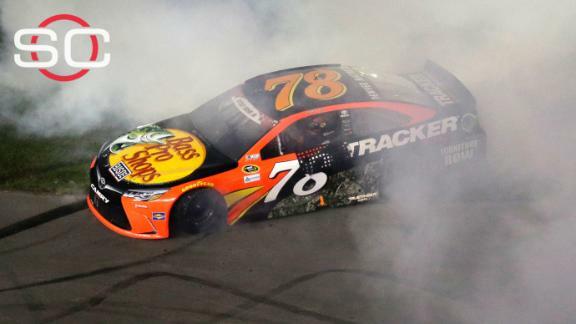 Truex showed that in a big way Sunday night, leading a NASCAR-record 588 of 600 miles to win the Coca-Cola 600 and break free of the bad luck that seemed to hit him when he dominated races. "The whole weekend was one of those fairy-tale weekends," said Truex, who started from the pole. "But even leading at the end, I thought, 'All right, when's the caution going to hit.' And it didn't." A year ago here, Truex led the most laps at 131, but he fell to fifth when he pitted for fuel late and four cars, including winner Carl Edwards, stayed out. Truex won for the fourth time in the series and the first time since last June at Pocono. "We're going to keep pushing hard and work toward that championship goal," Truex said. Truex's win finished Memorial Day weekend's megaday of high-end racing that began with Lewis Hamilton's win at the Monaco Grand Prix and continued with American rookie Alexander Rossi's surprising triumph in the 100th running of the Indianapolis 500. Four-time Coca-Cola 600 winner Johnson was on Truex's door a handful of times on restarts, but then would fade back. Harvick, who won here in 2011 and 2013, was the best of the rest as he got by Johnson 44 laps from the end -- yet never made a serious run at the top. "I mean, they have had a few runs where they have just been the class of the field and things have kept them from Victory Lane," Johnson said. "Tonight he wasn't going to be denied, there was no way around that." Owner Roger Penske, who had a disappointing day at Indianapolis, hoped to rebound with his NASCAR duo of Keselowski and Joey Logano, who won the All-Star Race at the track last weekend. WHO'S HOT: Truex finally cashed in with a victory when he had the most dominant car. Truex locked up a spot in the Chase for a Championship and marked himself as a car to beat heading into the summer. WHO'S NOT: Kyle Busch has suddenly gone cold; this was his second straight finish in the 30s after spending much of the season in the top five. Busch wound up 33rd at Charlotte after finishing 30th at Dover. He had nine top-five finishes, including three victories, in the first 11 races. WHAT WRECKS? NASCAR's longest race of the season was also among its cleanest, with just four cautions -- and one of those was to check tire wear over the first 25 laps. The four caution periods took up just 19 laps, leading to Charlotte records for fastest average speed (160.644 mph) and fastest race (three hours, 44 minutes, eight seconds). Both marks eclipsed records from 2012 (average speed of 155.687 mph; time of three hours, 51 minutes, 15 seconds). DID YOU SEE THAT? The biggest wow moments probably came prerace when the United States military put on a Memorial Day weekend display for the large crowd. There were tanks, soldiers marching down the steps of the stands, a flyover and a paratrooper display. UP NEXT: Pocono Raceway, June 5. Truex is the defending winner. Martin Truex Jr. leads for 392 of the 400 laps at Charlotte and picks up his first Sprint Cup Series win of the season.